A lovely fruity start with loads of pears, yellow apples and exotic fruits - banana in particular. This is followed by vanilla and toffee, with fine oak and wine gum flavour in the background. An enticing nose! Initially sweet and deliciously fruity on the palate with pears and yellow apples, immediately followed by a subtle warming spiciness of white pepper and oak. Vanilla and toffee arrive, lingering with a floral note and drier oak towards the finish. The pleasant spiciness increases with a second sip. The finish shows good length. Warming with dry oaky notes. Fresh on the nose when a few drops of water are added. The delicate exotic fruitiness is tamed while oak spice and floral notes take over. Still sweet on the palate with vanilla and toffee, however, less fruity. The warming spiciness is reduced, the same with oak and pepper spice. More floral notes towards the finish. The finish is short, creamy with vanilla and dry oaky notes. A very enjoyable malt from the past. Inebriant, especially for the nose. Unexpectedly spicy on the palate with a warm and dry oaky finish. 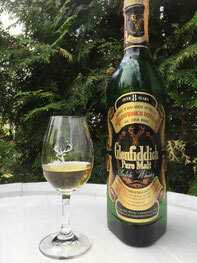 A clean, well-made, attractive and lively Speyside whisky.